You still have time to spread some Harvest cheer with this easy do-it-yourself project. No green thumb required – follow these 4 easy steps to one of our favorite d.i.y. projects. 1. Cut the top of your pumpkin(s) to get a clean and straight edge, removing the top stem as well. 2. With your spoon, start to scoop out a good amount of that pumpkin “stuffing”. Feeling more crafty? Use that stuffing to bake pumpkin seeds or a home-made pumpkin pie. 3. Place you plastic baggie inside the emptied pumpkin and fill it with your soil/sand mixture. Fill this baggie about half way full. *Get baggies without the super ziplock top, you won’t need it. 4. Start placing and planting your succulents inside the soil/baggie. If necessary, dig holes to really get the succulents anchored in the pumpkin. 5. Optional: feel free to add some Sphagnum Moss around the base of all succulents to further secure them in the pumpkin. Don’t over water these succulents, mist once to twice per week. Best spot for your succulents in any container is in a cool (not cold) spot with a medium supply of morning light. Pumpkins start to decay in about 5-7 days. When this happens don’t throw those green succulents away. Simply remove them with the plastic bag in tact and plant them in a new lovely planter from Interior Gardens. 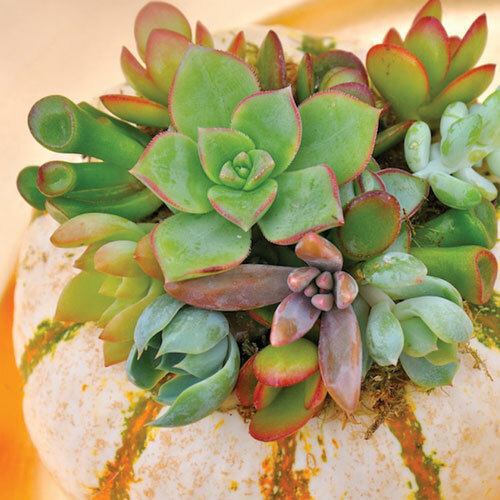 Use your finished succulent pumpkins as indoor plant life and decoration or give them as gifts to a host at a holiday dinner party this month. Visit Interior Garden’s showroom and pick up a variety of succulents to start your project today!